Last week, The Voice returned for its seventh season! 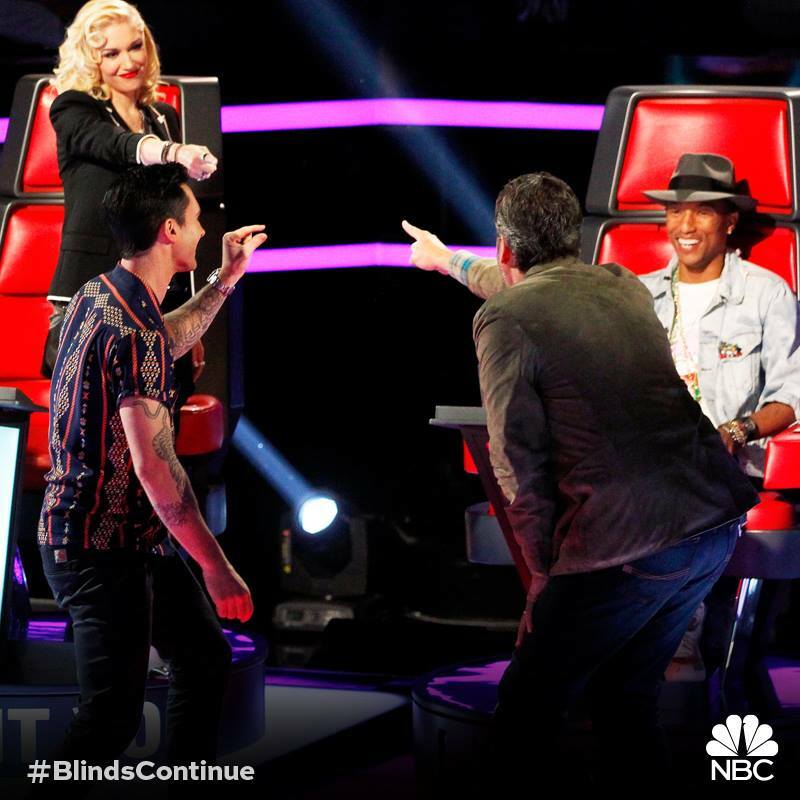 Music superstars Gwen Stefani and Pharrell Williams joined voice veterans Adam Levine and Blake Shelton, as they each recruited the best talent across the nation to join their teams! 25-year-old Chicago native John Martin kicked off the third night of Blind Auditions! While he works at a forklift operator for 50 hours a week, John works at random gigs. John’s cover of “Sweet Pea” started out with a gorgeous whistle and then, he showcased his range. John has a great falsetto and tone that caught the attention of Blake, Gwen and Pharrell. When the coaches asked what kind of music that he would like to do, he said: “cheesy love songs.” While Gwen perked up, John decided to join Team Blake! 18-year-old Jessie Pitts comes from an eight member family! After she survived an accident that left her with third-degree burns, Jessie turned to music and soared. She tackled Brandi Carlile’s “The Story” and immediately caught the attention of Gwen and Blake. While there were some pitchy and shrieking moments, Jessie delivered a good cover. Blake tried to seduce her with telling her that Brandi sang the song at his wedding to Miranda Lambert. However, she enlisted in Team Gwen! Like Jessie, 19-year-old Ricky Manning comes from a huge family! He caught the music bug when he was in third grade and busked in New York City. When I first heard his cover of “Love Me Again,’ Ricky showcased both his vocal runs and creativity with his rearrangement of the radio hit. While it caught the attention of both Pharrell and Blake, and he chose the former…I believe that Ricky’s vocal skills and creativity might come in handy during the Battle Rounds. 31-year-old single mom Kelli Douglas left the teaching world to pursue her dreams of being a professional singer. She also wanted to prove to her son, Alexander that he could reach for his dream. The Dallas, Texas singer gave an intriguing R&B take on “Danny’s Song.” While there were some moments, Kelli’s lovely voice got the attention of Adam, Gwen and Blake. Blake tried to charm her with the southern appeal, Kelli became the fourth member of Team Adam! 25-year-old Blessing Offor was the first blind contestant in the show’s history. The New Yorker overcame his blindness and accomplished so much including playing the Kennedy Center seven times and studied songwriting in Nashville. While he is interested in soul music, he originally wanted to work with Blake due to his desire to work with impeccable songwriters. Blessing became the first contestant of the night to give me chills as he beautifully interpreted “Just the Two of Us,” which caught the attention of all four coaches at the last-minute. After hearing offers from all coaches, he surprisingly went with Pharrell! As Blessing and his family celebrated, Troy Richie entertained the crowd and won a spot on Team Gwen. While I thought that Troy would be a good artist with Gwen, he needs to pick another song because his cover of “Out of My League” was not entertaining! While I admire 19-year-old Mia Pfirrman for having the guts to audition for this show and scoring a spot on Team Adam, I thought that she sang “Unconditionally” very nasally. In fact, The Voice: Season Five winner Tessanne Chin’s cover was far superior and better! Carson traveled to Orange, California to recruit 24-year-old Bree Fontacarlo! Bree’s parents fell in love over music and Bree wanted to honor her folks (especially her father) and audition for the show. Her cover of “If Ain’t Me, Babe” was saucy and I fell in love with her husky-like vocals. She became the latest member of Team Blake and could be a dark horse in the competition. The final audition of the night belonged to Anita Antoinette! She returned to the NBC singing competition after two years (We miss you, CeeLo and Xtina!). Tonight, she taught America a strong lesson in perseverance and stole the night with her cover of Bob Marley’s “Turn the Lights Down Low.” This time, she got all four coaches to turn around and her runs were outstanding! Several of the coaches tried to get her on their team, Gwen stated that she pulled at her heartstrings and Adam pulled the Tessanne card. However, she picked Gwen!!! Tomorrow night, the Blinds continue as more artists try their chances in impressing the coaches!